Run-of-river hydroelectric power, a type of hydroelectric power generation that does not require the storage of significant quantities of water, is a clean, renewable and predictable source of energy. It has great potential not only in countries like Canada where 60% of energy comes from hydroelectric sources, but also in small and remote communities in Latin America that currently lack other sources of energy. In run-of-river schemes, running water is diverted from a flowing river and guided down a channel which leads to a generating house. From there, the force of the moving water spins a turbine and drives a generator. The water is fed back into the main river further downstream. Unlike the large hydroelectric projects, these systems contain a small dam that can store a limited quantity of water, enough for same-day use; it is not possible to store water for future use. Without a dam to store water, there is no stored power. This means that the capacity factor of run-of-river projects can vary from 40%-80%. When you compare this to the 89-90% capacity of a large hydroelectric power plant, it is easy to understand why these projects have only been viable in rivers with large year-round flow rates. Mini-hydro systems can be used for independent and stand-alone applications in isolated remote areas or connected to a centralized grid that stores the generated power. While maintenance costs are relatively low compared to other technologies, most of the costs are accrued in the building phase. Connecting the run-of-river system to the centralized grid can get expensive if the energy needs to be transmitted over a far distance. However, when the run-of-river projects are used to power small, isolated communities, the costs are significantly lower and can be an economical source of power. One aspect to take into consideration is how flow rates may be affected in the future by climate change. Periods of drought might cause the system to operate below capacity at certain times of the year. As a result, we are starting to see innovative projects that combine mini-hydropower and photovoltaics (PV) solar generation. With the cost of solar electricity declining significantly, this innovation has enabled solar PV to emerge as a cost-effective energy source in many regions across the world, including Latin America, even at small scale generation. Since mini-hydropower can counter power outages and help balance loads during periods of peak demand, this is a highly sought-after source of energy, especially in rural, mountainous areas. Coupling mini-hydropower with solar PV can provide a stable supply of electricity. Some parts of Central America already offer interesting opportunities for this hydro-solar combination. The region of Honduras close to San Pedro Sula and several rural, mountainous parts of Costa Rica are ideally suited for both hydro and solar generation at a small scale. The combined generation capacity of these combined projects normally ranges from 2 MW to up to 15 MW of clean, renewable energy. This is enough to satisfy the electricity needs of small communities of up to 10,000 people. The run-of-river systems currently established in rural communities of Latin America are showing great success. What is the environmental footprint of run-of-river? The environmental footprint on surrounding ecosystems, such as fish habitats, is significantly reduced in these run-of river schemes compared to large hydro plants. Although the impact is not completely eliminated, new technologies are being developed to reduce this impact even further. In addition, many countries are investing in research and development to make the technology more cost-effective. A large amount of the current research is focused on improving turbines, as they are the most expensive part of the system. However, there are other ways to reduce the costs of these projects such as through the sale of carbon offsets. Carbon offsets are credits for greenhouse gas reductions achieved by one party that can be purchased and used to compensate the emissions of another party. There are several international brokers, online retailers, and trading platforms where you can buy and sell these carbon offsets. These are beneficial to renewable energy producers as the selling of carbon offsets makes their projects more economically viable. At the same time, carbon offsets buyers benefit by using the carbon offsets to mitigate their greenhouse gas emissions. One example of a successful run-of-river system is in Central Peru, close to the imposing Andes. This small project generates around 10 MW of clean power and, since it started operations four years ago, has displaced a considerable amount of CO2 emissions. The Swedish government buys carbon offsets from the project, which helps generate additional revenue of around $40,000 annually. Part of those funds are reinvested in the community. This run-of-river system also produces positive environmental side effects beyond providing the community with clean energy; the water from the system flows downstream to irrigate small plots of agricultural land which benefits the local farmers. As technological breakthroughs for small hydroelectric turbines and solar panels continue to take place and new ways to reduce the environmental footprint even further are implemented, the opportunities to build these combined mini-hydropower and solar projects in Latin America will increase significantly. 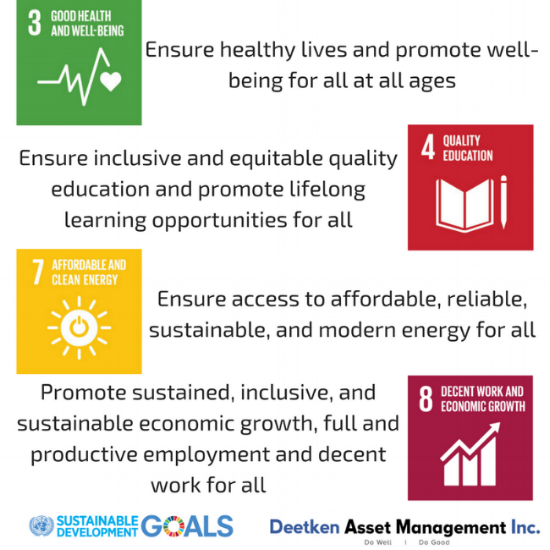 At Deetken Asset Management Inc., we expect to continue investing in these combined projects, as they will provide the right triple bottom line results we seek: financial, environmental, and social. Deetken Asset Management is excited to announce that Deetken Impact Bonds* are now available on the Frontfundr platform. This means that investors from across Canada can use their savings to benefit communities in Latin America and the Caribbean while earning market-based returns. Frontfundr is an innovative platform that offers regular investors access to private market opportunities like the Deetken Impact Bonds. If you’re ready to make a DIFference, check out our campaign on Frontfundr today! * Deetken Impact Bonds are issued by Deetken Impact Investment Corp., a feeder vehicle for the Deetken Impact Fund. Please be aware that investments of this nature carry risks to your capital as well as potential returns. Please read all investor materials before deciding to invest. You can also learn more about informed investing on InvestRight, a program of the British Columbia Securities Commission (BCSC). Written by Alexa Blain, Chief Operating Officer of Deetken Asset Management Inc.
On October 28th 1998, Hurricane Mitch struck Honduras and caused the worst flooding the country has experienced in close to 100 years. In addition to claiming thousands of lives and destroying an estimated 35,000 homes, Mitch decimated one of the main markets in Tegucigalpa, the country’s capital. In the aftermath of the disaster, most lending institutions were reluctant to provide credit to businesses that relied on a market that had been destroyed. How would these businesses repay loans, they asked, without a market to sell their products? Without these loans, people would not be able to restart their businesses, making the impact of the hurricane even more devastating. Fortunately, one organization was willing to provide this much needed credit. This was Fundación Covelo (“Covelo”), a pioneer of microfinance in Central America. Today, Covelo functions as a second level institution and facilitates US$ 31.7 Million in loans to 40 microfinance institutions, which in turn serve close to 300,000 clients in rural Honduras, Nicaragua, Guatemala and El Salvador. Covelo’s support targets low-income, mostly rural households. More than 53% of Covelo’s clients are women. Covelo has had a catalytic impact on the microfinance sector in Honduras. The foundation has supported the drafting and approval of regulatory laws for the sector and promoted a new field of study at the national university focused on building a technical career in microfinance. Through its MFI clients, Covelo provides or supports a range of services that have a social and/or environmental impact. These include, among other areas of focus, providing credit to micro, small and medium enterprises, including rural businesses; supporting social housing; and offering micro-insurance. In addition, Covelo is one of the few providers of student loans. It has not only promoted the creation of a specialized institution dedicated to educational loans but has also contributed its own funds to the project, targeting young students in Honduras in need of financial support in order to finish their studies and/or to progress to a higher or more specialized level of studies. Covelo has lent to approximately 800 low income students who have demonstrated high academic achievement. At DAMI, we are very pleased to be in negotiations, together with Inter-American Development Bank, to provide subordinated loans to Covelo. Our contribution will help the Covelo team support the 40 microfinance institutions who with whom they work. Learn more about Covelo by clicking here. What can your business do to combat the gender wage gap? As today is International Women’s Day, here at The Deetken Group, we took some time to reflect on what International Women’s Day means to us as a company. This brought us to thinking about how we could make a modest contribution to this important campaign. After much internal debate, we decided we wanted to reflect further on the continued disparity in economic outcomes between men and women – the pay gap – and what employers can do address this issue in the workplace. What is the economic impact of the “pay gap”? In Canada, women who are working full-time currently earn an average of 73.5% of what their male counterparts earn. This disparity in economic outcomes is not only a serious human rights issue, it also has a negative economic impact. In 2015, the Province of Ontario commissioned Deloitte, a consulting company, to estimate the economic impact of closing the wage gap as part of a report the Gender Wage Gap Strategy Steering Committee prepared for the Minister of Labour and Minister Responsible for Women’s Issues. Deloitte estimated that if women were compensated at the same rate as men based on demographic characteristics (e.g. education level, age, marital status), and experience in the workplace (e.g. job status, occupation, and sector), Ontario’s women would earn an average of $7,200 more per working year. This amounts to $18 billion dollars of forgone earnings in the Province. That’s 2.5% of Ontario’s GDP. Deloitte further estimated that the marginal increase in personal and sales taxes would be $2.6 billion and that government spending on social assistance, tax credits, and child benefits could decrease by $103 million due to increases in families’ incomes. In other words, closing the pay gap would have clear, positive economic implications for the province. Beyond this direct measurable impact, there is also a less measurable economic impact. The gender norms that so often influence men and women to make different career choices may prevent the efficient allocation of labour. For example, men enter the STEM (Science, Technology, Engineering and Math) professions and women choose careers in the healthcare or education professions because these seem to be more “gender appropriate”. Therefore we are left with workers who may be most productive in a role which has been socially deemed as “gender inappropriate” thereby self-selecting into careers to which they are less suited. This represents an additional productivity loss to the entire economy. Beyond the economic impact, a recent survey of 1,000 Canadians found that the majority of people agree that men and women do not receive equal pay for equal work and are not treated equally in the workplace. The survey also found that two thirds of respondents would be less likely to apply at an employer where they knew that women earned less than men for the same work – so how do we solve this problem? The first step to addressing the pay gap is to understand some of its key drivers. The issue is complex and depends on a number of factors, including, among others: differences in choice of occupation and difference in pay within the same occupation, we consider these below. (It is important to note that regardless of how the pay gap is dissected, a portion always remains attributable to overt discrimination). The difference in choice of occupation explains 15% of the gender wage gap. However, the view that this choice is free of discrimination makes things too simple. A recent report by the Canadian Centre for Policy Alternatives (CCPA) and Oxfam Canada found that, in Canada, jobs that are associated with traditionally unpaid and traditionally female work (e.g. caregiving) are poorly compensated compared to work of similar complexity and physical risk in male-dominated fields. For example, truck drivers (97% of whom are male) make a median annual wage of $45K, while childhood educators (97% of whom are female) make a median annual wage of $25K. Take a moment to consider the discrepancies in jobs requiring similar education and responsibility, or similar skills, but divided by gender. A New York Times article, drawing on extensive research, notes that the median earnings of information technology managers (mostly men) are 27% higher than human resources managers (mostly women). Janitors (usually men) earn 22% more than maids and housecleaners (usually women). In addition, as professions shift from being primarily male-dominated to primarily female-dominated, pay tends to decrease. For example, a study undertaken by Professor Levanon of the University of Haifa in Israel, found that between 1950 and 2000, the gender balance of workers in the recreation industry shifted from mostly men to mostly women. During the same period, median wages declined by 57% (after accounting for change in the value of the dollar). Overall, this study found that when women moved into occupations in large numbers, those jobs began paying less, even after controlling for education, work experience, skill, race and geography. To combat this phenomenon, a Harvard Business Review article suggests that managers, with their HR partners, should determine the value each position brings to the organization regardless of who occupies the position. By determining the level of knowledge, responsibility, and value to the organization each job contributes, the risk that women, especially women of colour, be penalized on future salaries based on past pay inequalities is reduced. These determinations can then be tempered by internal equity and the candidate’s experience and skill set. Because of the distribution of household labour, women are more likely to request flexible or fewer hours and this request can be met with disproportionately large pay cuts. The pay gap is particularly acute in professions where there is a premium placed on working long hours and being 100% available. (Finance, business consulting, and law are particularly well-known for these work patterns.) However, there are other highly specialized fields that have found ways to cope with these issues. Obstetrics, a field where professionals work in small groups to ensure someone is always available for a delivery, or pharmacy, where practitioners use technology that ensures patient information is highly consistent to enable efficient and consistent handover of work. Every profession and company is different, but an internal analysis will help to identify strategies to improve the linearity of pay with hours using work management methods and/or technology, among other potential solutions. Allowing this flexibility is not only beneficial for women, men are also increasingly requesting flexibility. Creating these opportunities at your own business may help to ensure you attract and retain the best employees. A few years ago, research suggested that the reason women make less is because they don’t ask for raises and promotions at the same rate as men (in 2003 Linda Babcock published ‘Women Don’t Ask’ covering this topic). However, a 2016 research paper out of the University of Warwick has found that in fact women do not ask for a raise less frequently than men. However, women are less likely to get what they ask for. This is supported by a 2007 paper by Harvard Kennedy School lecturer Hannah Bowles which suggests that both men and women are less likely to want to work with (or hire) women who ask for raises. At the same time, this behaviour from men is not only tolerated but rewarded with higher compensation. This trend is consistent with broader research that suggests women face social and financial repercussions when they behave assertively. A number of countries have started to demand that employers either report earnings by demographic characteristics to the government (e.g. the US) or that employers disclose the differences in pay between their male and female employees and even post the pay gap on their website (e.g. UK). Improving pay transparency could be achieved by publicizing the formula used to determine salary, or like Whole Foods, making salaries public to all employees. By adding transparency to the pay structure, compensation can be abstracted away from how the assertive behaviour of asking for a raise is perceived and rewarded by managers. Of course, on its own, pay transparency isn’t enough to close the wage gap but, combined with real commitment on the part of the company can encourage open dialogue about what factors determine pay and ensure these factors are merit-based. The evidence for spin off effects of these policies is mixed. They could be negative (reducing company morale) or positive (improving retention) and likely depends on current compensation structure and company culture. After all that talk, what is Deetken doing? At Deetken, we work hard to ensure an equitable workplace. We also allow for flexibility for all our employees so they are able to meet the demands of both the workplace and their home lives. In addition, through Deetken Asset Management Inc. (our financing arm), we are committed to supporting organizations that support women and equality in the workplace. For example, for the past 5 years we have been funding Pro Mujer, an institution that economically empowers female entrepreneurs in Latin America (see our forthcoming “Reflections” piece on Pro Mujer). 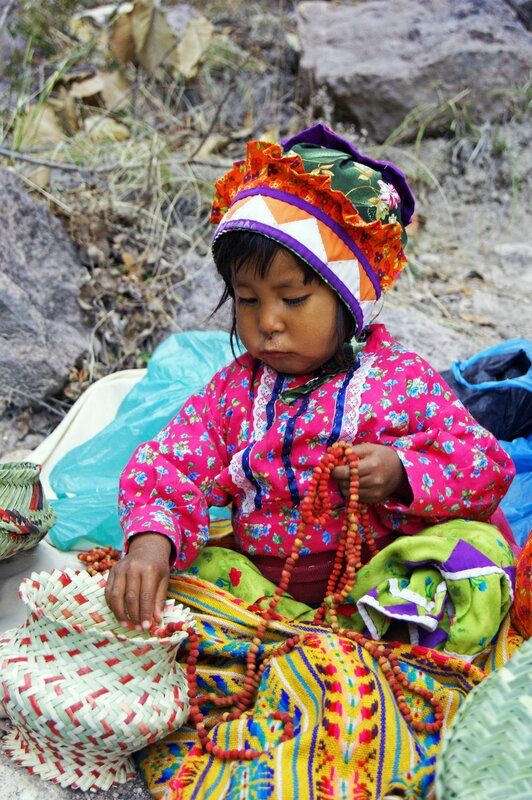 Pro Mujer is committed to helping women in Latin America to become agents of change by using an integrated approach which extends access to finance, health and educational services. With commitment from all of us - both as employers and employees - we can work to close the pay gap and in so doing improve economic prosperity for all residents and a more equal society for ourselves and generations to come. Of course, it is important to note that the firm-level strategies suggested here do not replace the need for broader policy changes required to lift Canada from its 35th placing on the World Economic Forum gender gap list. There is much more work to be done. At Deetken Asset Management Inc. (DAMI), we want more Canadians to have access to high quality impact investment opportunities. In addition to the choices we make as consumers, how we choose to invest our savings is one of the most powerful ways we impact the world around us. Learn more by watching this video and following this link. Deetken Asset Management Inc. (DAMI) and ABACO have been working together since 2008, co-investing in Microfinance and MSMEs opportunities and also working together in technical assistance projects funded by international development banks - IDB, CAF, etc. Learn more by watching this video. Deekten Asset Management Inc. (DAMI) and Oikocredit share a common mission to provide financial and technical support to organizations in developing economies, promote a healthy impact investor eco-system in Canada and provide investor choice to Canadian investors. Learn more by watching this video. Last month I attended the RIA Foundation & Endowment Forum in Toronto. The forum was hosted by the Responsible Investment Association (RIA), Canada's membership association for socially and environmentally responsible investment. It focused on responsible and impact investing through the incorporation of environmental, social and governance (ESG) factors. The event was run exceptionally well with informed and engaging speakers. Discussions surfaced some of the real issues that investors face in adopting an impact focus, including accessing investment vehicles that deliver commercial risk adjusted returns, provide liquidity, and deliver measurable impact. As investors, these issues are front of mind for us at Deetken. I was encouraged to see that they are directly addressed by the Deetken Impact Fund (DIF), one of Canada's first registered international impact investment funds. I came home feeling even more confident that our approach with the DIF is something innovative and that the Fund is in uniquely positioned to meet the needs of other investors looking to tilt their portfolio towards an impact focus. Of special note, we were pleased to attend as special guests of our new partner Oikocredit and look forward to the next RIA event in Vancouver in 2017. Read more about Deetken Asset Management Inc. and the Deetken Impact Fund. The Deetken Group (1) and Oikocredit have entered into an Exempt Market Dealing ("EMD") Services agreement to distribute Oikocredit's securities ("Depository Receipts") in several Canadian provinces, including, but not limited to, Ontario, British Columbia and Alberta. The sale of these securities will take place by way of private placements. "We are pleased with the agreement to help Oikocredit as an Exempt Market Dealer in several Canadian provinces," said Samir Shah, Director of The Deetken Group, "There is a strong alignment between our organizations in terms of our focus on impact investments. Oikocredit is a global leader in this investment category, and The Deetken Group is committed to continue to strengthen commercial bonds with like-minded organizations. We see this agreement as part of our mission to improve access to impact investment products for Canadians." "We see a lot of demand for impact investments that combat poverty and contribute to sustainability in developing countries," said Eugene Ellmen, Canadian Director for Oikocredit. "This agreement permits us to reach out to accredited investors across Canada to help meet this demand." The Deetken Group is a management consulting and investment firm based in Vancouver, Canada. 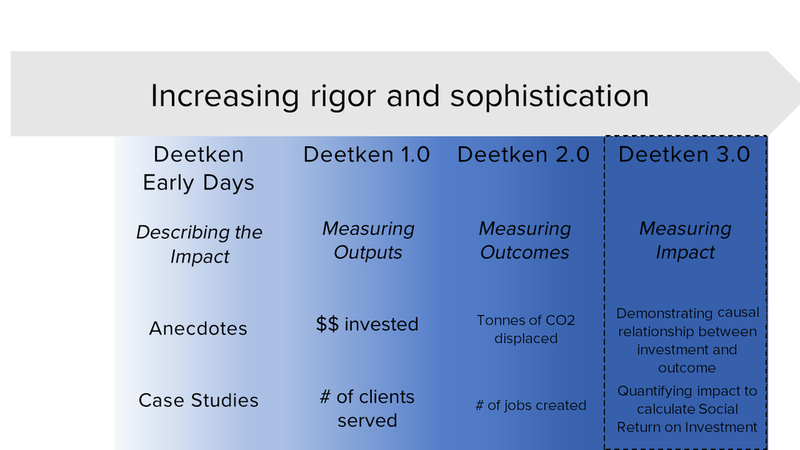 With close to a decade of active investing in impact-based organizations, The Deetken Group is a pioneer in the impact investment space in Canada. Through deep financial and strategic analysis, and strong local relationships in the countries we work in, we are able to generate sustainable, long-term returns on our investments. Oikocredit has over 40 years' experience in funding to partner organizations active in inclusive finance (including microfinance), agriculture and renewable energy. Oikocredit's loans an investments enable people living on low incomes to sustainably improve their living standards. Oikocredit finances more than 780 partners in over 70 countries and its outstanding capital totals € 940 million. (1) Deetken Asset Management Inc. is registered as an Exempt Market Dealer in the provinces it is distributing Depository Receipts. Deetken Asset Management Inc. is pleased to announce the first close of the Deetken Impact Fund (or “DIF”) -- - one of Canada’s first registered international impact investment funds. 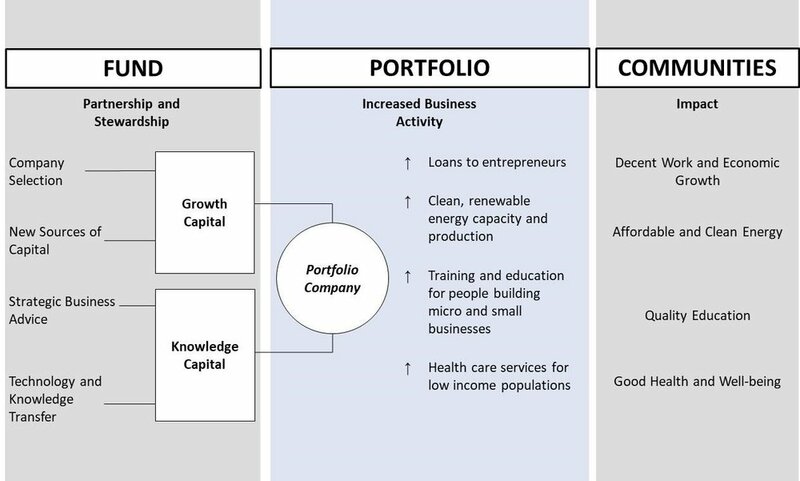 DIF aims to deliver strong, consistent returns by investing in exceptional businesses that promote entrepreneurship and improve access to basic services, including clean renewable energy, healthcare and affordable housing. It has a clear double/triple-bottom line mandate: to have a measurable positive social and/or environmental impact in the communities where it operates as well as yield market-based returns. The Fund’s geographic focus is Latin America and the Caribbean, where Deetken Asset Management has a strong pipeline of investment opportunities in sustainable mid-sized projects and businesses. DIF is domiciled in Canada and managed by Deetken Asset Management Inc., a registered Investment Fund Manager, Portfolio Manager and Exempt Market Dealer with the BC and Alberta Securities Commissions. Deetken Asset Management Inc. is a joint venture between The Deetken Group, a Vancouver–based asset management and business advisory firm, and Cooperativa Abaco, Peru’s largest credit union. Together, these founding partners bring decades of experience in impact investments across Latin America and North America.